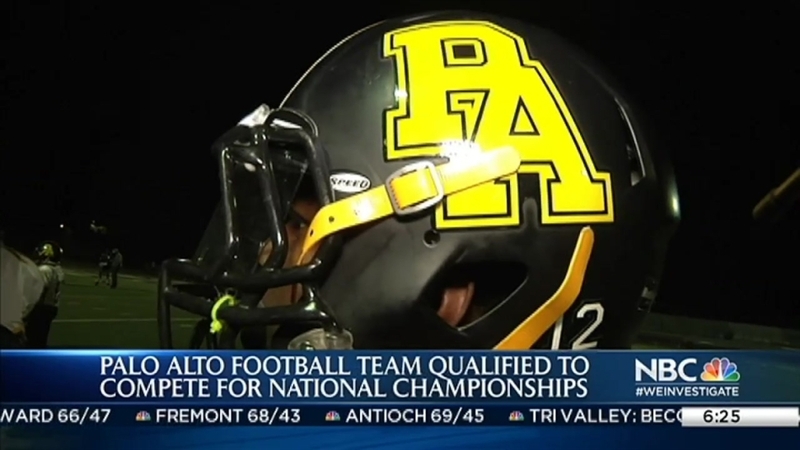 Young football players from both East Palo Alto and Palo Alto have joined forces and are now one team headed to a national championship. The Palo Alto Knights combine players from both cities, mixing talent along with racial and ethnic demographics. "The idea was to take away some boundaries and to have the kids play together," said coach Rob Castaneda. "In other sports, boundaries define where kids are allowed to play, and for us it was just about bringing two communities together to put together a team," he said. The merge happened this year when the former East Palo Alto Greyhounds and the Redwood City 49ers joined the Palo Alto Knights for financial reasons. Some of the players go to school together but most met for the first time on the field. "We went from three teams to one family. It's a brotherhood now," said eighth grader Kevin Cullen, who's from Palo Alto. The team admits, initially, the idea of a merger was tough for some of the coaches and players to accept. But they say the change has made them stronger. "From Day One, it didn't take the kids any time to get to know each other," said coach Eric Stuart. "It didn't take them any time to start jelling as a group, as brothers, as a team. They've really done a great job and kind of taught the coaches a lesson." The 13-year-old and under players all hang out on and off the field. "I knew how well these guys played football, but I didn’t know how funny these guys were," said player Eric Stuart, Jr. "I like hanging out with them on Friday nights at the Palo Alto games." The Knights are so far undefeated with an 8-0 record, and the team has already qualified for the American Youth Football National Championships in December. The Knights cheer squad, which also has girls from both cities, will be there too, also competing for the championship. The Palo Alto Knights are raising over $30,000 to make sure all the players can make the trip together. "They’re like brothers playing in the huddle together," Castaneda said. "That’s what life is about, right? Life is not about where you’re from. It’s about the journey and where you’re going."